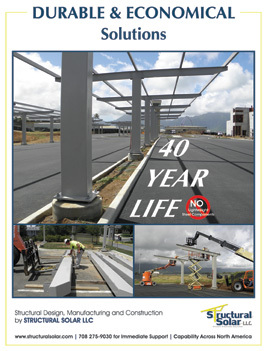 Structural Solar LLC is a design-build company who specializes in solar parking canopies. Accordingly, instead of hot, unproductive and generally unattractive parking areas, parking lots are transformed into large productive solar arrays that provide shade, inspiration and low maintenance solar installations. Solar parking canopies from Structural Solar are highly durable and designed to fit the logistics and size of the parking areas. Typically, the solar parking canopies qualify for the investment tax credit and increase the value of the property. Structural solar is the leading supplier of solar canopies and almost always works directly on behalf of leading solar developers who specialize in higher profile commercial, institutional and municipal solar projects. In most cases, developers turn to solar parking canopies because there is insufficient roof area to accommodate the target installation size. Solar parking canopies are increasingly popular as an alternative to rooftop installations. Depending on owner preference, Structural Solar offers solar canopies with either industrial -marine grade paint or hot dipped galvanized coatings. Structural Solar utilizes ultra-efficient sales and design process and can take the project from concept to completion quickly and seamlessly. Accordingly, the company has become the premier supplier of solar parking canopies for installations across the country and particularly along the seaboard and snow-belt states where corrosion is a concern. For more information on how the company can make a difference in your project, visit the company’s website or call Bob Pegnato at 708 275-9030 for direct and immediate consultation.